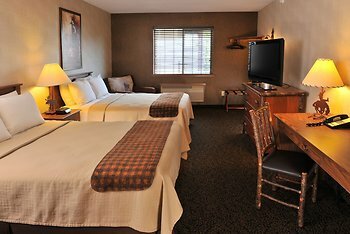 Stoney Creek Hotel & Conference Center St. Joseph, St. Joseph, United States of America - Lowest Rate Guaranteed! When you stay at Stoney Creek Hotel & Conference Center St. Joseph in St. Joseph, you'll be in the suburbs, within a 5-minute drive of Glore Psychiatric Museum and Albrecht-Kemper Museum of Art. This hotel is 3 mi (4.8 km) from Pony Express Monument and 3 mi (4.8 km) from Mount Mora Cemetery. Very friendly and helpful staff. The ambiance and decor made it feel like a mountain lodge. The pool and spa area were amazing! I would have liked to see a better variety of hot foods on the breakfast buffet. The room was large and the beds were comfortable. Very nice pool and the breakfast was good. The many items to see within and around the Lodge. There's a life sized buffalo statue, and small fountain pools with lilly pads on the lawn outside by the pool area, and a bear carved outta wood in the main lobby. Breakfast is GREAT. Anything n everything. I've stayed at the lodge three on times. Very clean and great to see many families enjoying the pools with their kids. Room was comfortable and had plenty of space for me and my teenager. I loved the fact they had laundry facilities. The breakfast was awesome and the staff were very friendly! Coffee was always hot and delicious! We didn't get to stay in the actual hotel long, but we brought 2 children and the pool was great to keep them entertained. I was overly impressed with the bags they had available for our wrestlers the next morning to take along with them, they didn't have to do that and went above and beyond to accommodate to them. Very friendly staff! Wish the rooms had safes in the room.